LANCASTER COUNTY, Pa. (January 8, 2014) – Turkey Hill Dairy is going Greek in 2014 with the addition of four Limited Edition flavors of Greek Frozen Yogurt, including Baklava, Lemoni Biskoti, Raspberry Chokolata, and Sea Salt Caramel Truffle. 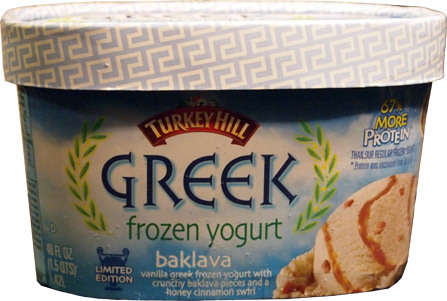 · Turkey Hill’s Baklava Limited Edition Greek Frozen Yogurt: Will be offered January through March, and contains vanilla Greek frozen yogurt with crunchy baklava pieces and a honey cinnamon swirl. · Turkey Hill’s Lemoni Biskoti Limited Edition Greek Frozen Yogurt: Will be offered April through June, and includes lemon cream Greek frozen yogurt with a lemon shortbread swirl. · Turkey Hill’s Raspberry Chokolata Limited Edition Greek Frozen Yogurt: Will be offered July through September, and contains raspberry Greek frozen yogurt with melt-in-your-mouth chocolaty slivers. · Turkey Hill’s Sea Salt Caramel Truffle Limited Edition Greek Frozen Yogurt:Will be offered October through December, and boasts caramel Greek frozen yogurt with sea salted caramel truffles. The Dairy’s Limited Edition Greek Frozen Yogurt flavors contain low-fat frozen yogurt and has 67 percent more protein than Turkey Hill’s regular frozen yogurt. Turkey Hill Dairy, the fifth largest-selling premium ice cream brand, continually changes its Limited Edition ice cream flavors to provide consumers with a variety of choices throughout the year. Turkey Hill Dairy’s Limited Edition Greek Frozen Yogurt flavors are available at select grocers and convenience stores where Turkey Hill products are sold. 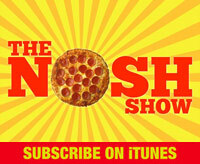 For more information, or for a schedule of upcoming Limited Edition flavors, visit turkeyhill.com. Located in the rich farming country of Lancaster County, Pa., Turkey Hill Dairy produces the fifth largest-selling premium ice cream brand and one of the leading refrigerated iced tea brands in the nation. Over the past 20 years, Turkey Hill has tripled in size and now sells products in 49 states and a dozen countries on three continents. Guided by traditional values and inspired by its family-owned heritage, Turkey Hill Dairy considers all of its associates, partners and customers a part of the Turkey Hill family. The company believes part of its corporate responsibility is to be a good steward of its resources, community, and the world, and is actively defining and implementing green initiatives to cut down on waste, reduce packaging, and minimize outputs into the environment. To put its core values of sustainability into practice, Turkey Hill even generates 25 percent of the Dairy’s annual electricity needs by harnessing wind power through its own wind turbines located onsite at the Dairy. For more information on Turkey Hill Dairy, visitturkeyhill.com, read its blog, the Ice Cream Journal, or follow Turkey Hill Dairy on Twitter or on Facebook.